A distinction must be drawn between the interlocking technology and the automatic train-running control system. The two systems combine to ensure that trains can travel on the track system safely, without problems and on schedule. The new and upgraded sections of line have electronic signal boxes instead of the previously used relay technology. The electronic signal boxes are operated from operations control centres. Electronic signal boxes allow more efficient and cost-effective operational management because the computer-based technology allows points and signals to be controlled over significantly larger areas. The signallers can monitor and control the train traffic on monitors. The overhead line network can also be controlled and monitored from the operations control centres. At the speed of 250 km/h at which an ICE train travels, the train driver is no longer able to follow the signals on the line reliably. That is why signals at fixed locations (intermittent train-running control) have been replaced by a system in the driver's cabin. An electronic monitoring system (continuous automatic train-running control system) is installed along the entire line. 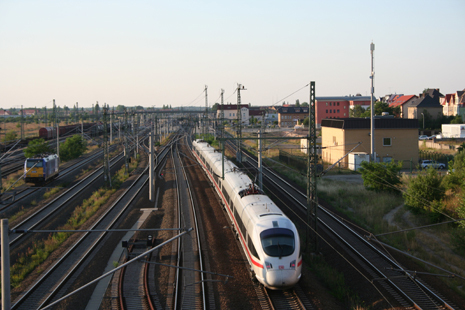 Continuous automatic train-running control is a system used by Deutsche Bahn on all high-speed lines. It ensures that a train always keeps to the right speed. 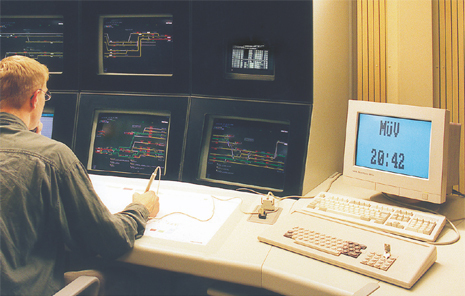 In this system, data is exchanged between a computer on the train and the line control centres by means of a cable located centrally on the track. The system provides the driver with information such as the distance to the destination, the target speed and the signals to be expected up to 10 kilometres in advance. The train can also be driven automatically to suit the operating conditions. As a fallback solution to this system, the line is also equipped with the same kind of signalling equipment found on other high-speed lines. Whereas the new line only has continuous automatic train-running control, the upgraded line has a combined system of continuous automatic train-running control and intermittent train-running control, depending on the speed permitted on the relevant section of line.